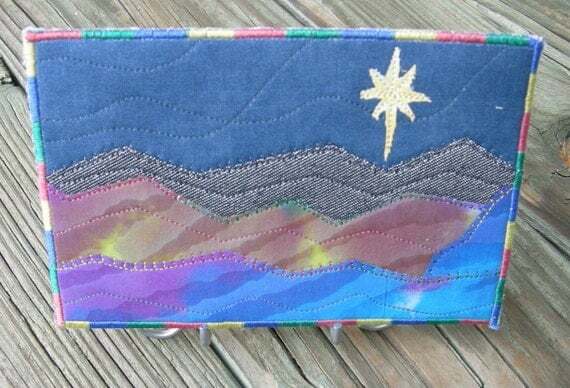 This week we head to Morganton, NC not too far from Asheville, where we find the lovely shop of Asheville Etsy Street Team member Linda Johnson of Sew Upscale. I admire people you can take scraps of fabric and create a landscape or anything for that matter. I am in love with her fabric postcards,what a unique idea. 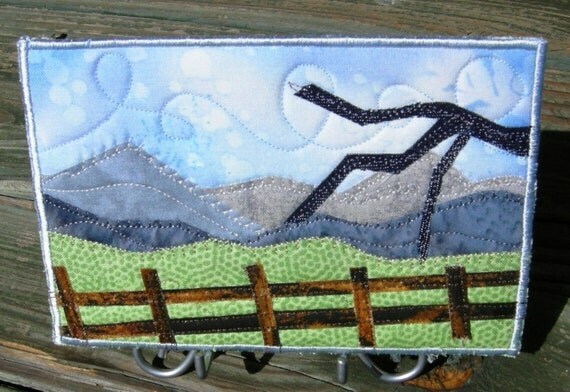 I can see her love of the Western Carolina mountains represented in many of her designs. There is something so comforting in her creations maybe its my love of nature but I think you will enjoy reading about about how she creates her pieces. So read on and thanks to Sew Upscale for giving us a look into her process. How did you get started with Etsy? I first joined Etsy as a buyer. My son told me about the site. He heard about it from a friend. I later decided to start a shop. What inspires you? I’m inspired by my surroundings, by the landscape, by colors and by fabric. I even like thread. Almost everything inspires me! Where is your hometown? and current location? I’m from Asheville, NC but now live in Morganton, NC which is about 50 miles east of Asheville. What do you like about where you live now? Morganton is a small town. Anywhere you go, you always know someone. The weather is very moderate although it can get hot in the summer. How did you begin with your art? I first started sewing when I was about 9 or 10 years old. 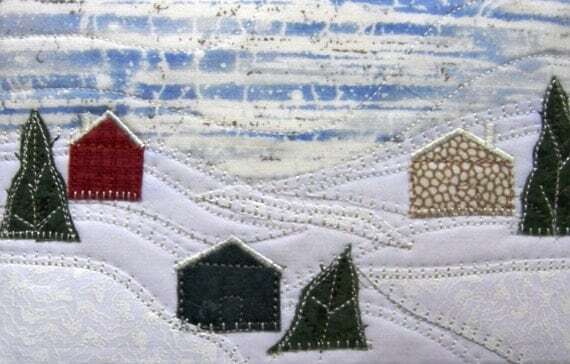 I first started making quilted fabric postcards about 3 or 4 years ago. I saw one and thought it would be great for me since they are small and could be finished in a short amount of time. I have a problem with finishing projects! I taught myself how to make them and have since developed my own style. My favorite subject matter is the mountains. But I also love making any kind of landscape. Do you work outside of the home? I no longer work outside the home. I left my full time job as a social worker recently after having a heart attack. The stress in that job was so great. 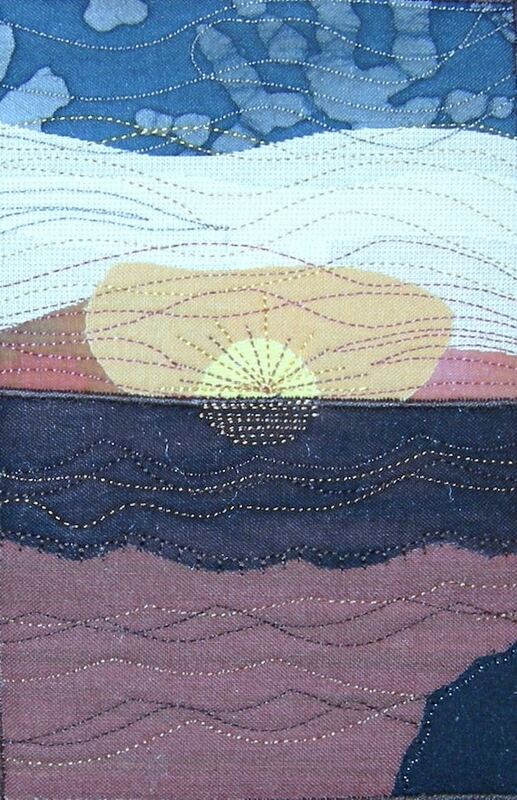 I am now concentrating on my quilted fabric postcard business. Are you more creative in the morning or evening? I’m usually more creative about mid morning. I like to get my workout finished before I start work on my art. What do you do for fun? Love to hike, travel, and spend time with my family especially my granddaughter, Nadia. How would you describe your experience with Etsy? Etsy has been a work in progress for me and for Etsy. I think Etsy is very easy to use. I am constantly learning more on how to make my shop better. The photographs are the hardest part for me. Do you sell your products on other sites? 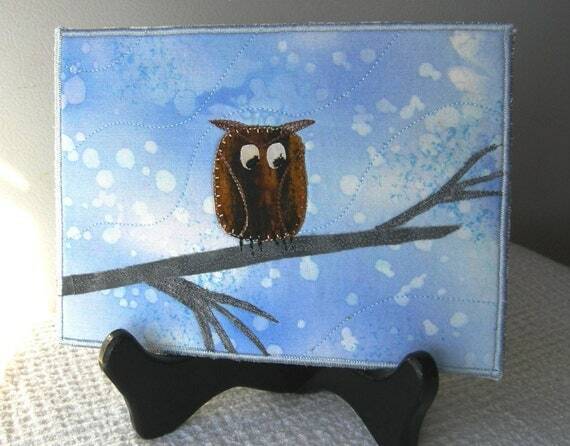 I have a shop on Artfire but I don’t spend much time on it. I also have a beautiful website my son designed. Do you sell in Etsy BNR’s? What do you like or dislike about the experience? I haven’t participated in the BNR. If you have other sites, blogs, facebook etc, please list your links here. Hi! Last summer I purchased some postcards from Linda and sent them to my sister and friend. They make a great gift. I always love to look through Linda’s shop to see what she is making. 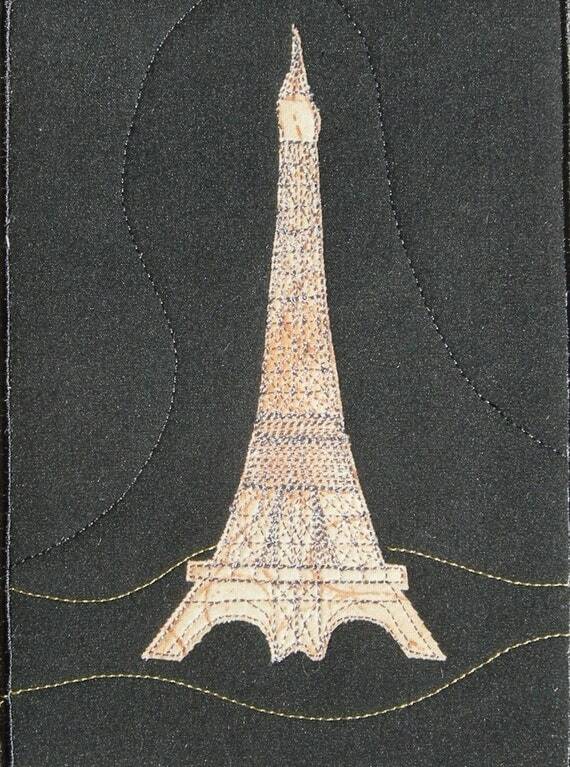 She has so many beautiful postcards and they are well made too!